In order to understand the hows and whys of animal behavior, we often must dig deeply into the origins of a species and take a closer look at its ancestors. So it is with the whitetail. It’s commonly thought that the deer family, Cervidae, evolved somewhere in the tropics of Asia, then expanded east and west into Europe and the Americas, respectively. This process began sometime during the Pleistocene Era — the so-called “Age of Mammals,” which ended around 11,700 years ago — a time at which the number of species was proliferating into a vast array of biological “experiments.” If a form of mammal could be dreamed up, paleontologists probably have found the remains of something like it. The ancestral home of deer could be characterized as heavy tropical forest. While such habitats are even today rich in species diversity, populations of large animals are very low, due to the nature of the habitat. Larger animals that eat vegetation require many pounds of it each day, and this vegetation needs to be nutritious. As is the case today, a given unit of land could support only so many individuals. The low population density and very nature of the forest forced the ancestors of modern deer to develop innovative ways to find mates. Most mammals aren’t particularly vocal. Deer do make a variety of sounds, of course, but sound doesn’t travel well in thick vegetation. For that reason, presumably, scent became the deer family’s primary means of communication. Early deer-like animals evolved structures we think served to dissipate scent. These growths on their heads, which we call ossicones, took many forms. They probably were covered by skin and hair. The structures might have been glandular, but they also might have been used to pick up scent from other parts of the body. Many of these early deer had fangs used for combat and protection. Such teeth remain today in Chinese water deer (Hydropotes inermis), which have been known to maim dogs when attacked. Most likely, the bugling teeth of elk and the occasional canine teeth found in whitetails attest to this ancestral trait. There are other theories as to the function of ossicones, including heat dissipation, social display and scent dispersal. Perhaps all of these came into play at one time or another. There’s nothing wrong with the idea that an organ can have more than one function. No one knows how these animals used scent to communicate, but based on what modern deer do, they probably rubbed the structures on vegetation. Think of it as the original social network. Over time, the ossicones lost their skin covering and became weapons of combat, mostly in males. This shift to what we now call antlers probably happened gradually. As deer evolved, they developed two primary social structures: The first is solitary and the second is small family groups and herds. The whitetail falls into the first category. A dominant resident buck grows up pretty close to where he was born, although sometimes relocates to another place. Regardless, he spends his life in a relatively small area. A dominant floater, on the other hand, is a wanderer. I feel floaters are much better fighters and that the serious fights hunters report probably are clashes between dominant residents and dominant floaters. This aerial photo overlay shows buck sign on a 4,000-acre Georgia tract. Each location was mapped by walking the land and using GPS to pinpoint rubs (yellow) and scrapes (red) across the property. Such sign is all part of a complex web of herd communication. However, it’s a mistake to assume does and bucks only interact during a narrow part of autumn, or that all behaviors we see during the rut are restricted to that time frame. We recently made discoveries of scraping, scenting and posturing behaviors during spring and summer. Here at the Institute for White-tailed Deer Management and Research, we were among the first to identify and name the most active social center of whitetails: the staging area. It’s generally located downwind (based on prevailing wind) of common feeding areas, where bucks go to intercept does coming to eat. These areas have an open understory and many young trees on which bucks can rub. The most important of these rubs is the signpost, which is a special kind of rub in which a dominant buck rubs the bark off using the base of his antlers and then deposits scent from his forehead gland. The signpost has both a visual and olfactory function. Bucks tend to select tree species with bright under- bark, which makes them highly visible from a distance. Willows, conifers, hollies and other species are preferred. Once the signpost is sufficiently constructed, the buck rubs the base of his antlers and forehead on it to announce his presence. I have included frames from videos we have taken over the years of this activity. Bucks generally are late sleepers and tend to get up from their daytime beds, work another type of signpost around the bed, then head out for a specific staging area. How they chose them I do not know, but they do make a decision (at least at that moment). Arriving at the staging area just at dark, each buck works his signpost, then lies down or just hangs around the area, waiting on does. Our videos clearly show that a subordinate buck will also visit the rub. But he’ll smell the signpost without adding scent to it. 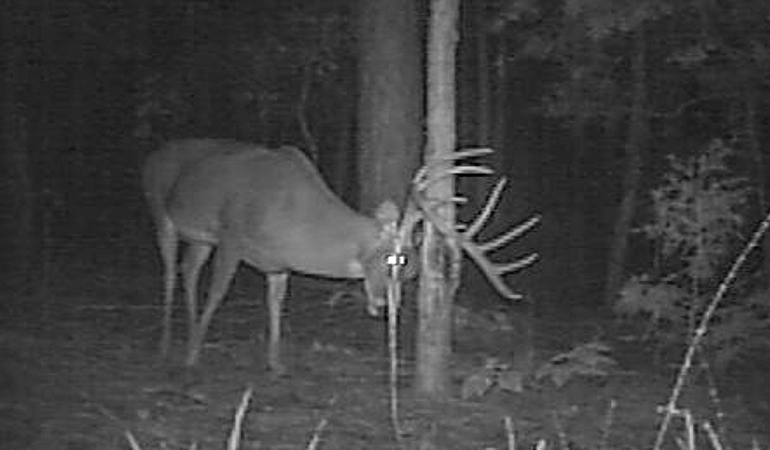 Does also visit signposts of dominant bucks (see video frame) and rub their foreheads on them. We’ve seen that red deer (Cervus elaphus) females will rub male scent over their shoulders and back. Their reason for doing this is currently unknown, but I tend to think it helps them thwart unwanted suitors. I have no evidence one way or another. The rubs and scrapes you often encounter also have their functions, serving as a “social network” in the deer community. Over the last two decades, we’ve been conducting studies using GPS to locate and map rubs and scrapes across the landscape, then using a geospatial analysis program to create deer-use maps of the land. 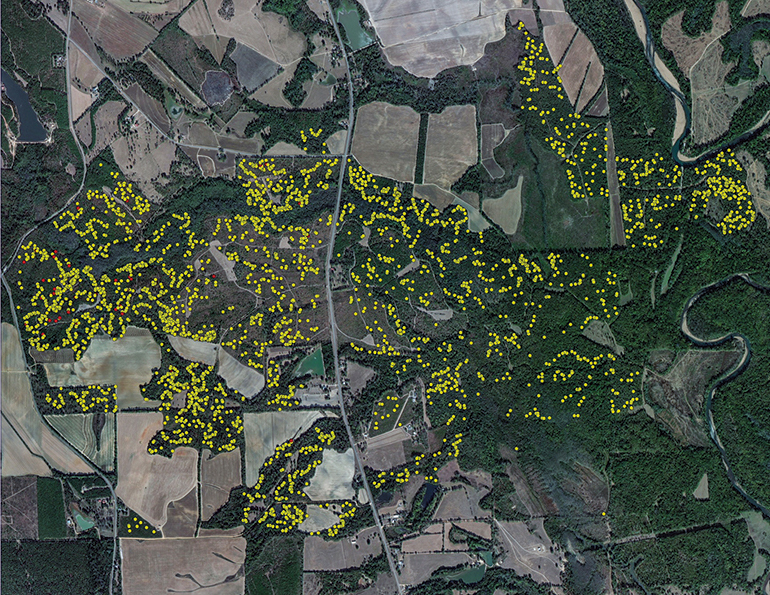 Most recently, my assistant Nathaniel Parker mapped the rubs and scrapes from 2017 over a 4,000-acre area in Georgia. The resulting map (page 16) is striking, to say the least. It’s allowing us to define landscape features that affect the movements of bucks. Needless to say, we’re learning a great deal about how they use their habitat. This study already is revealing areas of intense activity previously undiscovered and unreported. All these social and biological factors illustrate just how complicated our favorite game animal is. Next month, I’ll explain how you can turn this information into a successful hunting strategy year after year.